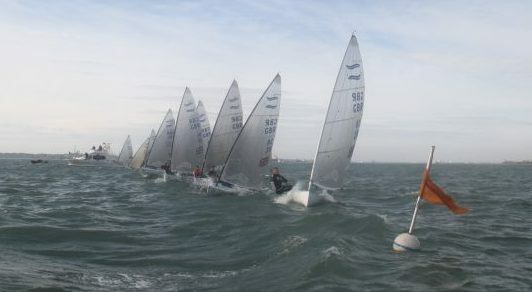 With 24 boats on the racecourse off the Meon shore of the Solent, Saturday brought a shifty northerly breeze of between 10 and 15 Knots with some very close racing between the leaders. Sailing a windward / leeward course with the pumping flag on, Martin Hughes (Warsash Sailing Club) toughed it out with Junior sailor Jack Arnell (Christchurch SC) who showed his athleticism downwind, with Martin taking line honours in the first race from Jack, with Simon Percival (Christchurch SC) in third. 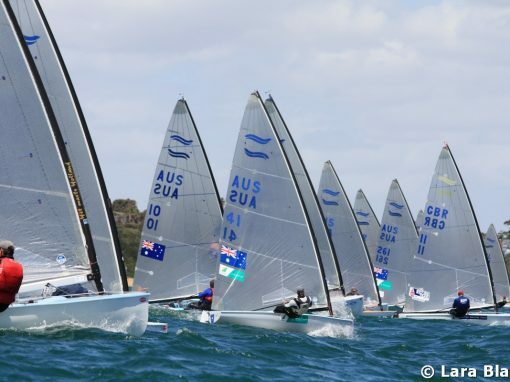 The second and third races of the day saw Simon Percival show great speed to take two wins, in what was pretty high octane races – three laps of a relatively short course, in a shifty but solid 12-15 knots. Whilst the younger and more agile members of the fleet showed us how to drop-pump downwind, the more mature sailors often gained upwind. In race two Percival held off Jack Arnell and Allen Burrell (Thorpe Bay YC) for the win, with Martin Hughes suffering gear failure. Race three again saw a tight battle for the lead which changed several times, Simon Percival again taking the win ahead of Hughes, Burrell and Arnell. 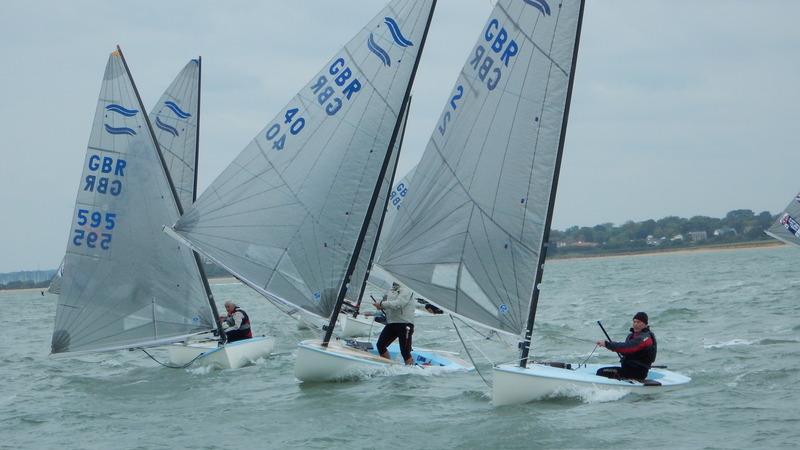 Newcomer Jim Downer (Gurnard SC) also impressed downwind, but his exuberant pumping style resulted in pulling his rudder off the pintles twice downwind, but he soon caught up again to claim a consistent 5,6,5 scoreline. Racing in the central Solent, Jim sailed over from the Island each day, in the true tradition of Finn sailing. Ashore, the Warsash Club put on a much needed tea after sailing and later a good meal for the exhausted sailors. Allen Burrell was presented with the season’s Travellers Trophy, which despite Warsash being the final event, he had won with the event to spare. Sunday’s racing started off with lighter winds and two general recalls, finally getting the first race away under a black flag. 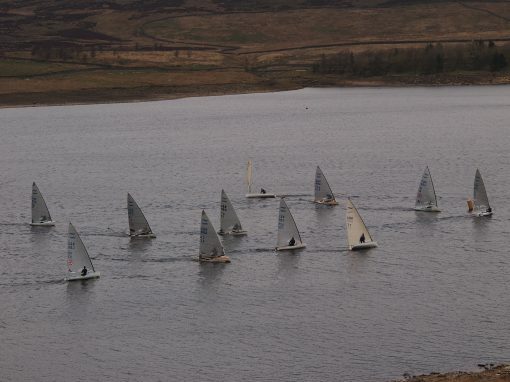 Shifty NE winds made each leg challenging with a flick to the left at the start tempting most boats that way, but Allen Burrell showed the courage of his convictions – heading hard right on his own to round the top mark clear ahead of Martin Hughes and Simon Percival. The second race started in a slightly stronger wind that quickly died away to 5 knots after the start with Burrell repeating the slow trek to the right, picking up more pressure and rounding the top mark with an even greater delta. The breeze was now extremely patchy and the building flood tide across the course made it vital to stay up tide on the run. Vince Hayter (Warsash SC) got it right to record a fine second with offshore sailor Steve Hayles (Christchurch SC) also reading it well to score his best result of the weekend in 3rd. The wind then died further and with time running out Race Officer Nigel Russell finally decided racing was abandoned. This left Simon Percival and Allen Burrell tied on 8 points so the result was finally decided on count back, Allen coming out the winner of the weekend, with local expert Martin Hughes third and new talent Jim Downer 4th. 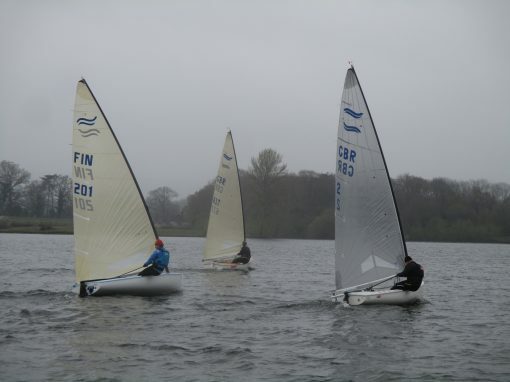 A great weekend’s racing to round off a very successful season of BFA events. The 2016 draft programme will be available soon, with the first event of the year likely to be at Alton Water on 16/17 April.